Hayat Shah is a 12 year old boy who lives in Milwaukee with his mother and father. While the family is Muslim, they do not regularly go to the mosque or discuss their faith. Hayat's father regularly cheats on his wife and the relationship between husband and wife is fraught with tension and arguments. When Mina, his mother's best friend, arrives to stay with the family, everything changes. Mina begins to teach Hayat about the Quran. Through their lessons, he learns new things about what it means to have faith and what it means to be a part of a family. This is a weighty story. American Dervish is about finding and losing faith, which is something that most of us will struggle with during our lives. Mr. Akhtar shows his readers the joy of belief and how devastating it can be when faith is used as a bludgeon. He deftly balances the hope that we will find happiness and a faith to call our own with the devastation of betrayal from the people we love most. While this story is often heartbreaking, Akhtar keeps it from becoming hopeless. I appreciated reading a story that portrayed a Muslim family honestly and with differing levels of devotion. We see many different kinds of people within these pages. Mina's family is bound to tradition and they are uncomfortable with her dating someone outside of their religion. Mina herself straddles a line between religious devotion and a modern mindset. While she believes in the beauty and goodness of the Quran, her life experience has taught her that not all Muslim people are good. Hayat's father scorns religion, even that of his family. He sees it only as a force for oppression and cruelty. Hayat experiences hatred on a personal and systemic level. When his beloved Mina starts dating a Jewish man named Nathan, Hayat becomes jealous. He decides to sabotage the relationship in a very juvenile, but brilliant, way. He also views the intolerance that is shown to Muslim people and the vitriol that some Muslims have for Jewish people. I have to confess that I have not read many novels about Muslim families. I don't know if this is because they are in short supply or because I haven't been looking hard enough for them. But I'm glad I read this one. 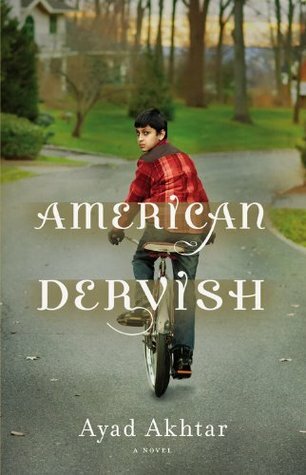 American Dervish is a nuanced look at a specific way of life and a reminder that we have many more similarities than differences. We all want something to believe in and to feel the security of a loving family. This is the perfect book for a reader who wants to witness a life that is different from theirs or is looking for a new and powerful coming of age story. I keep saying that I need to broaden my reading horizons. Thanks for introducing me to this new-to-me author! I believe that Akhtar is primarily a playwright. This is his first (and so far only) novel. I've been anticipating your review on this one. It sounds like a good one. Do you know if the author is muslim? Yes, I believe he is Muslim. I have read this one as well... And I did enjoy it. I thought there were some very interesting themes, such as immigration of course, but also the role of religion in modern life and what makes a good marriage. A few characters, I thought, were maybe painted as all good or evil, when maybe a more nuanced characterization would have worked better. But overall, a great read! Hmm...I see what you mean about nuanced characterization but I think I appreciated that we saw a variety of characters to begin with. We saw so many different levels of faith and belief in tradition. I loved this book. I agree with you that it was a powerful and different coming of age story. The angle of faith, having it and losing it and finding it, was refreshing and absorbing. I'm sort of inattentive (bone head), so I've seen this one pop up everywhere but I haven't been able to hold onto the blurb in my head. Now that I'm making a concerted effort to do that, I really want to read this book. I haven't read many (any?) books about Muslim families. Haha, I think it has more to do with being inundated by the millions and millions of books we could read! As I thought about it, I felt really awful that I hadn't read many books about Muslim families. But maybe there just aren't many to find!